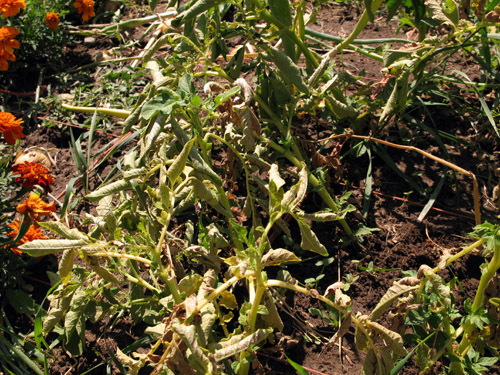 In the garden, Verticillium Wilt (VW) can affect potatoes, peppers, tomatoes, eggplant, some cole crops, tomatoes, lettuce, strawberries, cucurbits, artichokes, avocados, peaches, nectarines, caneberries, and apricots. It can also affect landscape plants and flowers. In fact, there are over 400 plant species that are affected by the Verticillium wilt disease (VW). Given the wide range of hosts that succumbs to VW, it is important to prevent, or at least manage, the disease. The fungus persists in soil for long periods. 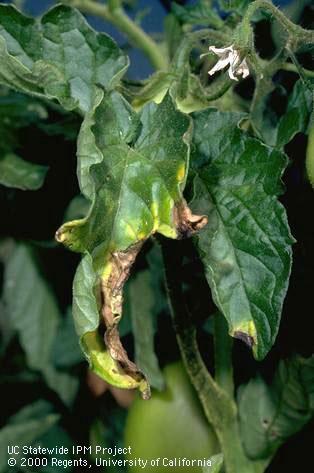 Although infection is favored by cool weather, because the fungus interferes with water transport in the stems, crop damage is most severe during periods of hot weather when plants are stressed for water. This is one of those diseases that can “crop” up on you (har har snort, pun intended), but with some forethought, can be avoided or at least minimized. If you suspect that your soil is infected with VW, the best way to know for sure is to have your soil tested by a plant & soil diagnostic laboratory. Use Resistant Cultivars. If you don’t have a problem with VW, then a great way to avoid it is to try to select resistant cultivars when choosing your starts. Some cultivars are more tolerant than others. Practice proper cultural practices in order to avoid stressing plants. For example, if growing artichokes, don’t take crowns to be used for propagation from where the disease has occurred (plant only pathogen-free plants). Likewise, don’t plant annual artichokes in an area with a history of V. dahliae. All annual artichoke varieties are more susceptible to VW than the perennial Green Globe variety so consider planting only perennial artichokes. Crop Rotation. Another way to manage VW is to rotate your crops. Don’t plant the same crop/similarly susceptible crop in the same area/bed in consecutive years. Ideally, rotate out susceptible crops for 2 to 3 years. For example, rotate the tomatoes and peppers with non-host crops such as beans, corn or broccoli. Cereals, grasses, and legumes are good rotation crops. Biofumigation. Planting broccoli, a non-host of VW, may also help reduce pathogen levels through a process called biofumigation: decaying broccoli residue, when disced into the soil, either gives off natural chemicals that can kill VW or alters the soil microflora so that VW survival is reduced. You can also use cauliflower too, but only in winter or early spring. Soil solarization. 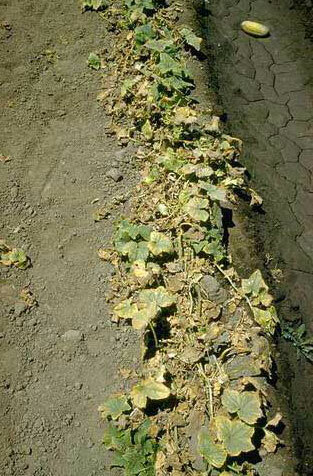 In warmer areas of the state, solarization is an effective control of soilborne pathogens and weeds. Solarization is carried out after the beds are formed and when the weather conditions are ideal (30-45 days of hot weather that promotes soil temperatures of at least 122°F). The effectiveness of solarization can be increased by solarizing after incorporating the residue of a cruciferous crop, in particular broccoli or mustards, into the soil. Next up, more on soil solarization. . .
← Potato Bag Gardening: The When, Where and the How. . . Thank you. I’m glad you’re enjoying the site. hundred five hundrednuclear familyin the pastfive hundred.